I have been dreaming about finally meeting the "one" and sharing our future love story here in my blog. Never in my dreams have I dreamed of a story between me and my ISP and sharing it here in my blog. And to think that this is actually happening to me right now. October 18, around 6:15 AM, I was doing my usual routine of logging in in MarketGlory and doing Referral fights when the DSL light [the third one in the modem] went off. This is usual for us since we often experience this but whenever I lift up the handset for a while, the light comes back then of course I put back down the handset. But this time it did not work and when I checked our landline, it had no dial tone. I had to finish my Referral fights first before troubleshooting our connection problem so I had to use my mobile data and finish what I needed to do. I had tried cleaning the cords and the outlet, checking if there is some physical damage or something but the result is none. 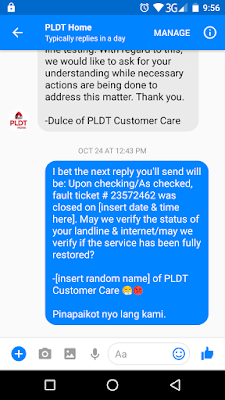 Since the landline is inaccessible I tried to contact PLDT via their Facebook page and messaged them about the problem around 11:15 AM. The next day, October 19 the problem still had not been fixed. I asked them what was the cause of the loss of service around 11:39 AM but I received no response. 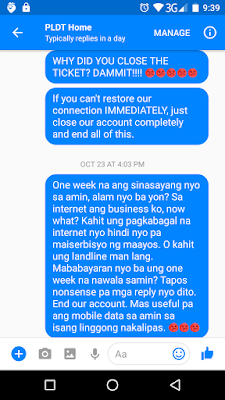 I messaged them again that night, 7:24 PM, telling them that we still have no internet and landline connection. 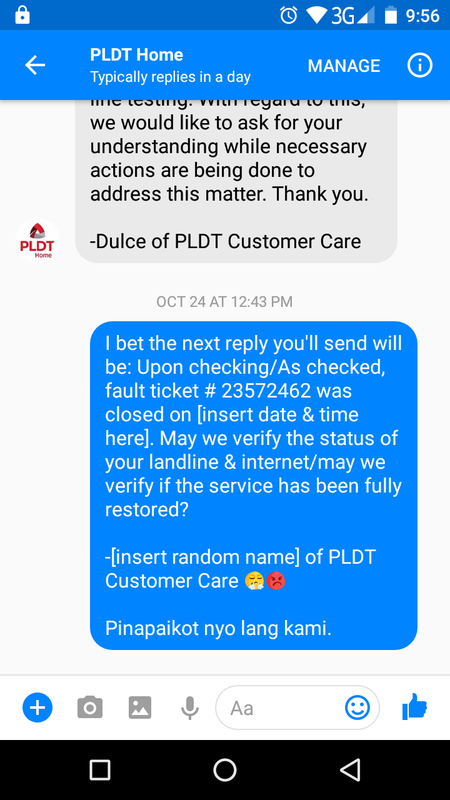 And they replied on October 20, 11:18 AM that the ticket was already closed last night around 6:23 PM and asking me if the connection was already restored. I replied with a capital N-O and asked them what they did to fix it that made them decide to close our ticket without even telling us anything. Their reply was made the next day, October 21 4:10 PM [see how fast they respond?] and gave me another fault ticket and informed me that "a house visit may not be necessary as the trouble may also occur at our outside facilities". They gave me this reply while my aunt called them that morning and was told that they will dispatch someone to check it in our house within the day. I messaged them that they still did not answer my question why they closed our first ticket. I also waited the whole day but no one came by to check the problem in our house. Sunday had passed and here comes Monday, October 23, they finally replied at 3:27 PM to inform me AGAIN that our fault ticket was closed yesterday at 6:10 PM and asking me about the status of our landline and internet. They replied the next day at 9:33 AM with the third ticket number for "remote line testing". 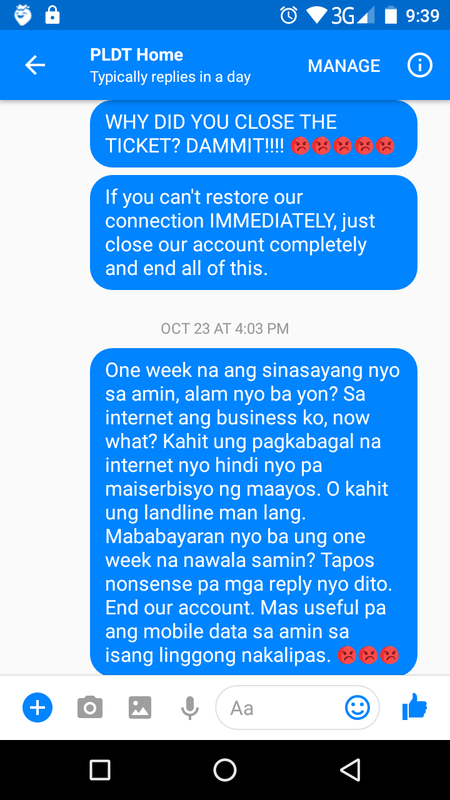 I lost my patience and went to PLDT - Cainta branch the following day, October 25. 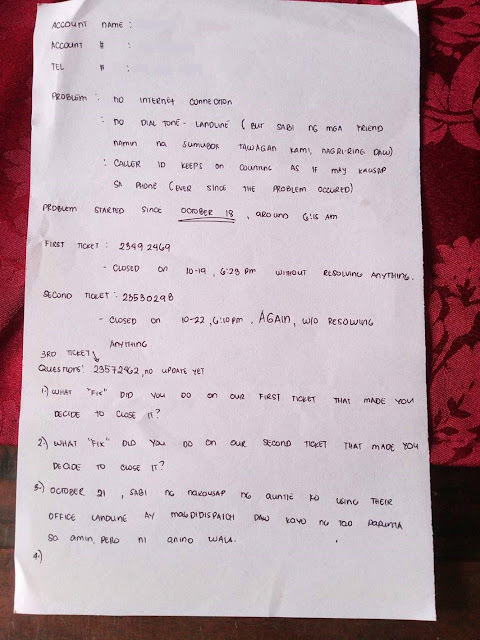 Instead of explaining everything again, I wrote it all down on a piece of paper before leaving the house and presented it to the Customer Care. He told me he cannot answer why the technical team closed our tickets because it is not provided to the reports sent to them [he even faced the monitor towards me to look at it]. He also informed me that they will send a technician to our house. No definite date though because according to him, it depends on the availability of the technician. While saying this he was also sending an email to the technical team located at the Cainta proper about the situation. I gave him my mobile number to give me updates then went home. A day had passed but I have not received any. October 27, the following day, is our bill's due date. I planned to go back to the branch to follow up about our concern when the technician arrived. They checked the what they called "mailbox" outside, inserted something in our PLDT connection outlet. It took them a while to fix it too. After finally restoring our connection, I went back to the branch the same day for rebate and pay our due. We got our rebate deducted immediately on our bill for that ten (10) days of headache and paid the remaining amount. If you somehow encounter this same kind of problem and plan to file for rebate, make sure you bring your copies of your reference numbers [ticket number] because based on my experience, when I told this to the customer care, she was asking again about the problem and telling me that the last issue filed in their system was on June/July [can't remember which of the two]. That is strange because the last customer care representative I talked to on October 25 even showed me the reports they receive and the recent tickets filed/closed. Fortunately ALL the conversations I made with the customer care on their Facebook page are saved on my phone so I presented it to her and she took note of the ticket numbers. So yeah, that was my 10-day struggle story with our ISP. If you know a better ISP within our area, Cainta, please feel free to let me know and I will do some research about it and contemplate if we will move to a new ISP. It happened to us too, twice in a span of a month. You just hear this loud crackling sound then no dial tone and of course no internet.